Suffer from lice, mites and fleas or your chickens? Finecto plus oral is an aromatic supplementary feed that makes the blood of chickens dirty for these annoying pests. Finecto plus oral is a 100% natural product. Horses and ponies are experience much nuisance and stress due to flies, mites, gnats and horseflies. With possible nasty results such as tail and sweet itch, scabies and mud fever. These problems are recognised as a result of much chafing and/or stamping, scabs and splits in the pastern cavity, scabs on the skin between the mane and at the tail. Chemical shampoos, insecticides and creams often have insufficient effect and are only applicable curatively. With the natural Finecto+ approach we make this problem manageable in a natural way. And the result? Healthier, less stressfull animals and better achievements. 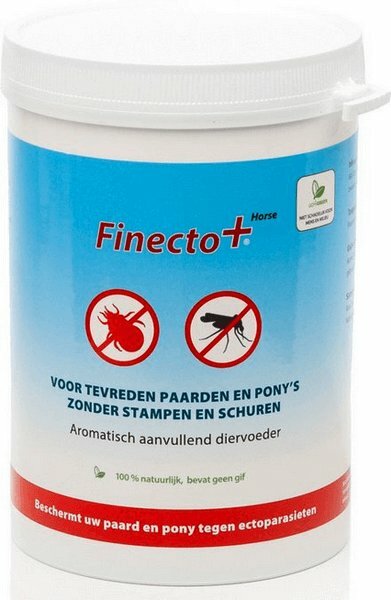 Finecto+Horse contains no chemicals, but only natural ingredients. The carefully selected aromatic substances and volatile oils in Finecto+ Horse have proven to be effective in the control of ectoparasites in horses and ponies. Prevent problems, apply treatment before it is too late. Finecto+Horse in the food protects your horse against ectoparasites. But Finecto+ Horse is also effective in the case of problems. Mites will leave the animal and flies, horseflies and gnats will no longer sting or bite. Agents applied externally are less effective when a horse sweats. Finecto+ Horse is more effective then. When the horse sweats more, smells are released, which midges, mites, flies and horseflies detest. The effectiveness increases during sweating /exertion. Finecto+ Horse makes the animal unattractive to ectoparasites. Ectoparasites will never become insensitive (resistant) to this. Horses weighing more than 400 Kg. 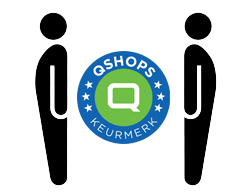 : 1st week 6 measuring spoons per horse per day, 2nd week 4 measuring spoons per day, after that 2 measuring spoons per day. Horses and ponies up to 400 Kg. : 1st week 3 measuring spoons per horse per day, 2nd week 2 measuring spoons per day, after that 1 measuring spoon per day. For a quicker result also rub the wounds well with Finecto+ Protect environment spray. Horses weighing more than 400 Kg. : 2 measuring spoons per day. Horses and ponies up to 400 Kg. : 1 measuring spoon per day. 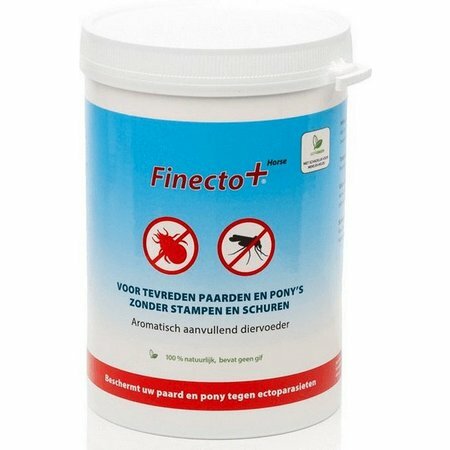 Finecto+ Horse is supplied in a 600-gram sealable jar, sufficient for 50 days preventative use in horses of more than 400 Kg. and 100 days in horses and ponies below 400 Kg. Calcium carbonate, Sodium and aromatic substances. Crude Protein: 11.7%. Total fat: 4.4%. Crude fibre: 5.1%. Crude ash: 28.92%. Sodium (Na): 463 mg/Kg. Lysine: 5.67 gram/Kg. Methionine: 1.43 gram/Kg.